All you need is faith, trust and a little bit of pixie dust! If only we could all live in Neverland - we'd think happy thoughts all day long and never grow up! Doesn't that sound wonderful? It's fun to have some Disney characters that sprinkle such wonderful happiness into all of us. 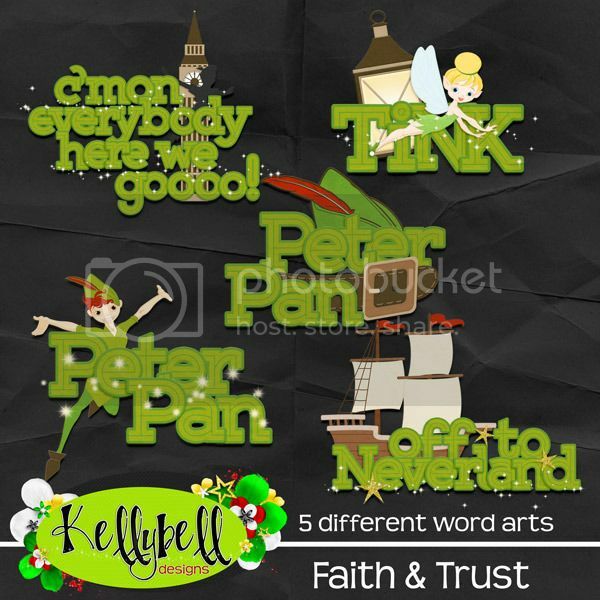 Kelly's got a new collection today that's perfect for all your Peter Pan and Tinker Bell meetings. It's a lovely new collection called Faith & Trust. How adorable is that new kit? It's filled with a bright green full alpha, 15 papers in assorted greens, yellows and browns, plus lots of elements including a pirate ship, Peter Pan doll, Tinker Bell doll, 2 Peter Pan hats, lantern, pixie dust, flairs, belt, telescope, dagger, clock, Big Ben tower, clouds, arrows, frames, flowers, banners, glitter stars, stitching and 10 word strips. So pretty. Kelly also made a set of 5 page starters and 4 layered paper stacks. These are so versatile and make for some quick start scrapping. There's a set of 5 word art titles and 6 fun journal cards. Make a trip over to the Kellybell Designs Store to stock up your shopping cart with this new collection. It's all on sale now for 25% off this weekend only. Have fun browsing Kelly's other character collections too. This new collection was a blast to scrap with. There's so many cute elements inside. Here's a page that I made. 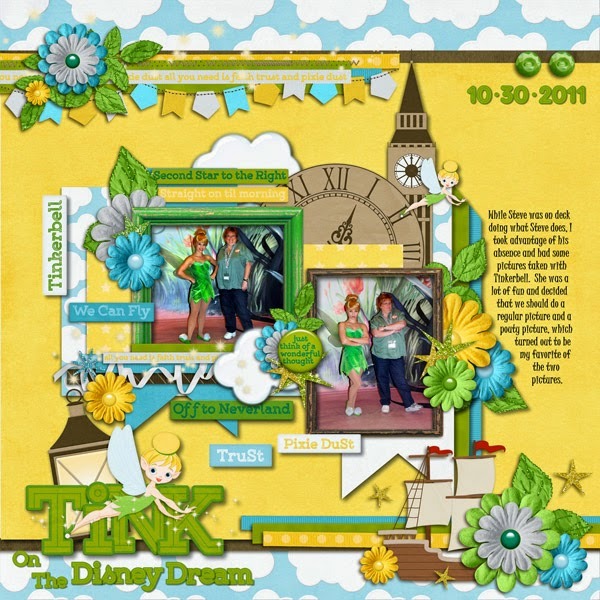 You can also find lots of layout inspiration at Kelly's Blog and Kelly's Facebook Page. 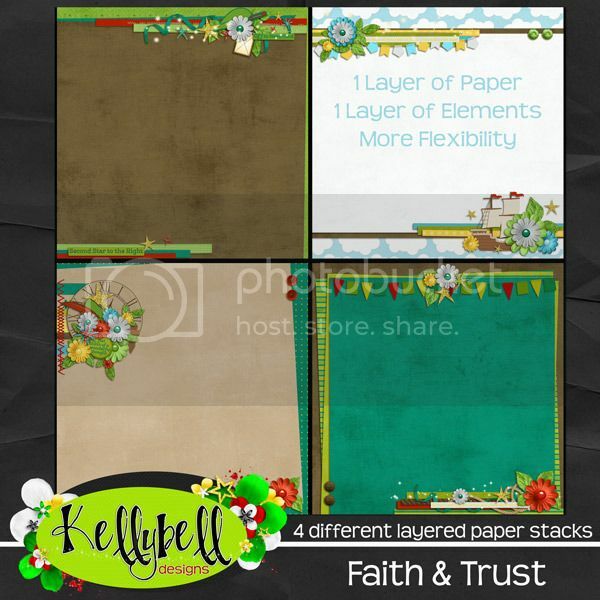 Kelly's Creative Team has some matching freebies for you today. They've made you a word art title, journal cards and a Quick Page. So amazing. Hurry on over to Jenn's Blog, JulieP's Blog and Lisa's Blog to find them. Give the gals a hug along the way and share some love and thanks. Have a great weekend and have fun scrapping your Peter Pan and Tinker Bell memories! Thanks for stopping by and happy scrappin!